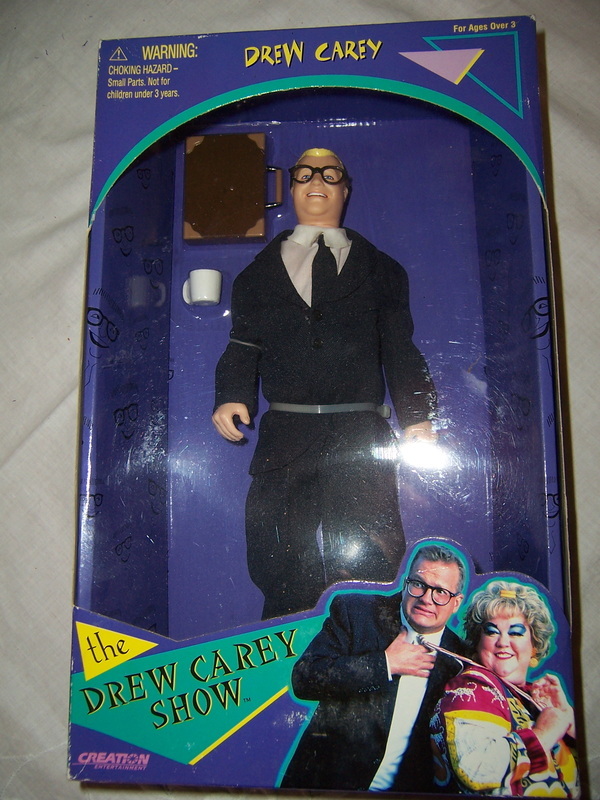 Drew Carey is a 12" plastic doll from the Drew Carey Show. Drew is dressed in his black suit, tie, black rimmed glasses and black shoes. He also has his brief case and his coffe cup. It has never been removed from his box, and is still seeled. The box is in very good condition but it is approx 10 years old and some of the corners are a little scuffed. We are also selling his lovable rival Mimi Bobeck. 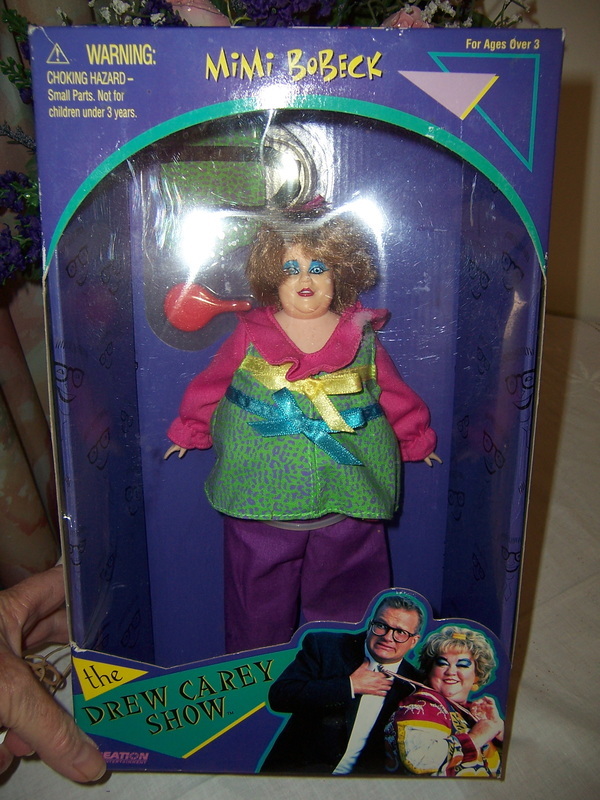 Mimi is a 12" plastic character doll from the Drew Carey Show. Mimi is dressed in her lime green and purple leopard print dress w ith her hot pink ruffles around her neck and hot pink sleeves. She also has her yellow and blue ribbon trims on her dress. Mimi has her purple pants and lime gree shoes to complete her outfit. Her garish painted face is adorned with adorned with her strawberry blond hair and pink ribbon. Also included is a matching green leopard carry bag and her pink mirror. It has never been removed from the box, and is still sealed. Do you remember the American sitcom called "Mork & Mindy" which was very popular TV show 1978 until 1982.? The series starred the late great comedian Robin Williams as Mork, an alien who came to Earth from the planet Ork in a large egg-shaped space ship, and Pam Dawber as Mindy McConnell, his human friend. Mork is in his original box and is still has original wire on the cardboard. He is made of plastic and he has jointed knees which bend and he can be put into a sitting position. He is dressed in his red space outfit with grey plastic boots. He also comes with his talking space pack. If you pull its ring the box says it will say 8 different Mork sayings. We have tried the ring and yes it still does work, however some of it is garbled but if you listen carefully then you can hear what appears to be - shazam, I am Mork from Ork, and Nanoo, Nanoo. It talks randomly so different things are said. Not sure if all the other sayings are working. It appears that he has not been played with at all. The box has no rips/tears and cellophane is complete on the box. The box does show some scuff marks which is understandable as it is over 30 years oldHe is approx 22cm tall. It is still wonderful that this toy still works after sitting idle in its original box for nearly 30 years. We also have Mindy for sale in her original box as well. Please see her below. Do you remember the American sitcom called "Mork & Mindy" which was very popular TV show 1978 until 1982? Mindy doll is approx 22cm tall. She is made of plastic and box says she is poseable. She is dressed in her original clothes of red jumper, blue jeans and brown shoes. Mindy is in her original box and is still attached to the cardboard. It appears she has not been played with at all. The box has no rips/tears and cellophane is complete on the box. The box does show some scuff marks which is understandable as it is over 30 years old. We also have Mork for sale in his original box as well. Please check him out.